Port-in your number & enjoy these benefits! When is the MNP port-in service to redONE Prepaid available? The MNP port-in service will be available starting 1 January 2018. Where can I request to port-in to redONE Prepaid? You can request to port-in at any redONE Branch Office or Partner Shops. When will I get the first RM5 credit? You will receive the FREE RM5 credit upon successful port-in. The RM5 will be credited to your account once you have received the SMS notification. For example, the line was successfully ported in on 8/1/2017. You will receive the first RM5 credit on 8/1/2017. When will I get the balance RM5 credit? You will receive the balance RM5 credit on the 1st of every month over the next 11 months. What is the validity of the RM5 credit? The RM5 credit is valid for 7 days. Unutilised airtime will be forfeited after 7 days. What can I use with the RM5 credit? The RM5 credit is an airtime credit. You can use the airtime credit to make domestic voice calls, send SMS, MMS, make video calls, PPU data & purchase Data Top Up. Can I use the RM5 credit when I am overseas? No. The RM5 is for domestic use within Malaysia only. When you are overseas, your data usage will be charged based on the respective country roaming rates. Please log on to www.redone.com.my/redoneprepaid for the list of roaming rates. I activated my SIM on 1 December 2017 and reloaded RM10. Which credit will be utilised first? The MNP port-in RM5 credit will be utilised first. 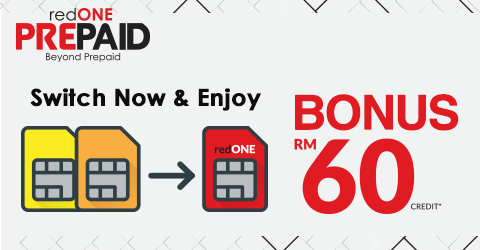 Once the RM5 credit is used up, your subsequent usage will be deducted from the RM10 reload. My line is suspended. Can I continue to use my MNP port-in RM5 credit? If your SIM is active, you can continue to utilise your RM5 credit until the end of the validity period. Do I need a new SIM Card when I change service providers? Yes, you will need to change to a new SIM Card. It will be issued to you when you ask to port-in to redONE Prepaid. Can I use the current SIM while waiting for my number to be ported over? There should not be any service disruption during the porting process to redONE Prepaid. Your current service provider has to ensure that there should be no change in the service offerings already subscribed to by the customer during the porting out process. You may port-in from your existing mobile service provider (“Donor Network Operator”), whether prepaid or postpaid service, into redONE’s network and retain your existing mobile numbers. You may experience service disruption during the porting out activity from the Donor Network Operator to redONE’s network. redONE may, upon receipt of port request from you, notify you by way of SMS the progress of your MNP port-in request. The mobile number(s) that you have requested for MNP must Malaysias number(s) and is(are) subjected to the approval of the Donor Network Operator. Mobile numbers which have been suspended, terminated, blacklisted on the defaulters’ database and/or barred shall not be eligible for MNP. You may request to port in to redONE Prepaid by providing your original national registration identity card (MyKad)/military ID/passport) during registration. You shall ensure that the identification of the NRIC or business registration number provided is valid and is not blacklisted from any defaulter’s database. You shall be responsible to fully settle all outstanding bills from the Donor Network Operator prior to your request for MNP, failing in which your request for MNP may be interrupted. For individual account, if you are the principal account holder for any supplementary lines, you are only allowed to port-in if all supplementary lines under your account are porting in to redONE. You may only request for MNP if your existing service with the Donor Network Operator is not under contract. In this instance, you may only proceed with your request for MNP if you terminate the contract with the Donor Network Operator and the cost of such termination shall be borne by you. You shall be solely responsible for all charges incurred by you, including but not limited to any and all outstanding payments and termination fees due and imposed to you by the Donor Network Operator. Service may be interrupted in the event that there is non-payment of any outstanding charges owing by you to the Donor Network Operator. If the mobile number which you have requested for MNP is not approved by the Donor Network Operator for any reason whatsoever, upon resolving the matter with the Donor Network Operator, you may continue with your application for MNP, subject to any processing charges which shall be borne by you. Approval from the Donor Network Operator is not obtained within twenty one (21) days from the date of your application.